Tuck into a great value lunch at OAKS, Fridays from 12-5pm. Available from the set menu. Book online for free text confirmation or call 0115 754 7244. 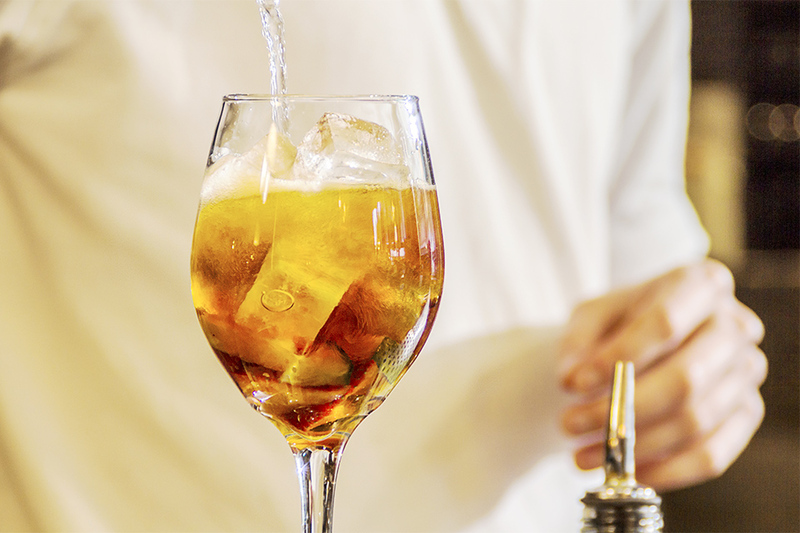 Enjoy a free pint of ale or lager with any burger purchased from the A La Carte menu at OAKS. Every Wednesday from 5pm. Book online for free text confirmation or call 0115 754 7244. Get stuck in to an 8oz rump steak with hand-cut chips & peppercorn sauce for just £9.99, every Thursday from 5pm at OAKS. Book online for free text confirmation or call 0115 754 7244. Kids can enjoy a main, two sides, ice cream and a drink for just £5 every day at OAKS. Available from the Kids Menu. Book online for free text confirmation or call 0115 754 7244. Why not be a part of the wall of fame in Oaks Restaurant and Bar and take on one of the Oak's Challenges. For just 19.95 complete the Little John Burger Challenge. Book online for free text confirmation or call 0115 754 7244. Nice food, pleasant service and a good vibe to the place! The meal was faultless, lovely place. Friendly and attentive service, but very disappointing food - we asked for the Sunday lunch beef to be medium, but were informed it would be being reheated and thus it would only be possible for it to be well done..! The accompaniments were also rather tasteless. Rather surprising, as my last Sunday lunch here around 18 months ago was very tasty. Staff excellent. Food as usual excellent. A quick Sunday lunch for three people. Two had the beef and one had the belly pork. It was super tasty, we all really liked the mustard and horseradish sauce on the side. Service was pleasant and efficient. Only criticism was the potion size was just not quite enough. I’d definitely go back as the other items on the menu look super tasty. There’s a few food challenges for those with a big appetite. All in all not a bad place to go dine on a Sunday. Nice cosy place, lovely service, food was fresh and very tasty (loved the veggie burger with rosemary fries!! ), generous portion for good value. Can't wait to come back! As usual great food,great service and fantastic staff. Liked this better at second time of visiting, good food at reasonable price, good service, but why do you think it’s ok to charge the earth for drinks? Lovely date night here, food and service were lovely. I love it at this restaurant. Been several times now & great food & service. Only downside this time was live music was just a bit loud making it hard to chat over dinner. Overall the food was average, very expensive for what it was. Service was good in terms of polite friendly staff, however, one of the orders was taken wrong and took a while to correct. The service was excellent from the moment we arrived. The staff were very caring and attentive. The food was superb and not overly expensive. I would definitely recommend to all I know. Very nice, large portion sizes and a very friendly service. Good food and service. Shame they have taken the sharing platters off the menu. Superb!!!! Awesome service, tasty food for an excellent price! Would definitely recommend. Enjoyable evening in pleasant surroundings with good service! Enjoyed it very much but they ran out of ribs, however reduced the cost to make up for this. Service a little slow but very nice and friendly. With good Sunday roast. Booked a surprise meal for my parents on their wedding anniversary, great service, great food and even live music! Would definitely reccomend to anyone. We were unable to have a meal there due to a fire the previous night. They were very good to contact me early on the day of reservation to inform me. For starters the restaurant was empty on 'steak night' and then when the steaks came they were over cooked. Highly recommend great all round restaurant. Really good food, nice atmosphere. Nice food and excellent service, live music was a little bit loud for an evening meal. Tables quite close together but overall quite good. Top meal, would recommend to everyone! Pleasant place to sit with friends and eat. Relaxed atmosphere with live music. Food good quality and very friendly staff. Visited on 'Burger Wednesday' with family for a birthday celebration. All meals were delicious: steak and burgers were amazing, chips the best I've ever had. Great value and service and will definitely visit again. Good food and good service. Great entertainment and atmosphere. OAKS was recommended by a friend and wasn't disappointed. Bottomless bbq was very nice, hot and very good quality. First visit and slightly disappointed after having read their reviews online. Was good but nothing extra special. They need to ditch the live band they had on that evening, which did nothing for the atmosphere at all! All four of us really enjoyed our first meal at Oaks. We will definitely come again! OAKS smells great. The wood barbecue gives off a lovely smell. The décor is nice. The staff were super attentive and friendly. The burgers looked amazing and so did the steaks but we didn't have burgers or steaks, we had the vegetarian plank for a starter. That was quite nice but the battered halloumi completely filled me up. I ordered half a chicken for main course and it was delicious if not a little too salty. The side order of chips was a disappointment. They were burnt looking and soggy. The side order of coleslaw was just a chopped salad with loads of salt and oil on it. The side order of salad was the same. My wife's sausage was a foot long sausage on a plank. It was quite tasty but very filling. I didn't know what to expect when I booked the table. I don't think the menu works unless you want a burger or steak. The side orders are not good. The guitarists were very welcome and they made the evening but just as I was getting into them they packed up and left at 9pm. Overall it was a pleasant evening but very overpriced. I would go back there for the burgers although there are lots of burger joints in Nottingham that I would go to before this place. Excellent meal, will be going again! Excellent in all categories! A thoroughly enjoyable evening! Service was amazing at OAKS and the food was nice. Another great meal with great service, well recommended! While the meal and atmosphere was lovely I didn't like the fact we had to share and couldn't pick what we wanted. It wasn't clear upon booking that we had to share and if we wanted the steak cooked differently we couldn't as it could only be cooked one way. We enjoyed our evening but wouldn't book that type of meal again. Couldn't fault the food at OAKs, service made me feel a little forgotten though. Granted we were 5 minutes early for the table so were asked to grab a drink at the bar, only to be sat there for half an hour. Then once we were shown to our table, it took another 30 minutes to have our order taken. Once the order was taken though the food was out quickly and tasted great! Will definitely return for the great steak! Lovely cosy atmosphere, great service, nice food and good value. Steaks perfectly cooked and the cucumber gin cocktail was delicious. OAKS has the best steak in the midlands! Good service, superb night! We will be back soon! Booked Oaks for our company Christmas lunch and we had a great time. The food was tasty and plentiful, we were also happy to see all staff members were catered for well (2 veggies + 2 gluten intolerance). Overall I thoroughly recommend a trip to Oaks. Had yet another meal at OAKS! I had a rump steak and my partner had a rib eye they was cooked the way we like them med and just beautiful we had three sides; naked coleslaw which is tasty, chips which are not greasy and green beans in garlic butter which are amazing! The staff are very polite and friendly and can't do enough for you! We love this place and visit as much as we can! Had a amazing Sunday platter for two with my partner at OAKS, the beef was so tender it was wonderful! The vegetables were beautiful! Roasted potatoes were fluffy and crispy and as for the yorkey puds they was just huge and great topped off with beautiful gravy! Great food, packed and live music, excellent. Tasty steak, but overcooked. Delicious buttery green beans in garlic. Loud live music. We went on a Tuesday for Rump steak night at OAKS. Lovely meal and friendly staff! Went for our pearl anniversary at OAKS and had a fantastic night! We really enjoyed our meal at OAKS, the atmosphere was great and felt like we could be in any cosmopolitan city. The food was simple but delicious and the cocktails were great. It also didnt break the bank. We had a very relaxed meal here and will definitely be back. Had a fantastic evening. We went for my friends birthday last night and had the sharing platter for 4. It was divine, best sausages I have ever eaten. So much food, it was amazing. Lovely Prosecco too. We will be back! I thought this restaurant was brilliant. Great food, great atmosphere, attentive staff. Home made sauces, sustainably sourced food... Without an off putting price tag... Definitely be back! Love this place, steak is lush, service is amazing and professional! Service was good at OAKS but very slow on serving drinks. Thoroughly enjoyed our meal at OAKS, courteous staff, helpful and informative, good menu choice, excellent value! The food was very good at OAKS, it was hot, but turned cold very quickly as we sat on the tiled tables. Also had to ask for a mat as the plate kept sliding about the table. Excellent service at OAKS, food quality was great and value was brilliant! We had the roast for two which was very tasty and our daughter dined from the children's menu which had plenty of choice. Will definitely revisit and recommend! We had a great night at OAKS for the #Rumpday this Tuesday. We both had the sirloin steak which was very tasty and well cooked considering it was only £10 each! Good atmosphere for a Tuesday night and the service was great too, would happily return again soon. First visit to OAKS. Excellent all round. Will certainly go again! Enjoyable hour & half spent here for a Sunday lunch. Excellent food, brillantly presented. Lovely wine, great beer. Friendly staff. Will be going back. Great steaks and lamb chops at OAKS! Went mid week for the steak deal, meal was as described steak cooked as requested. OAKS is a little more refined than the other Smokehouses in town. We opted for the sharing Cote de Boeuf which was delicious and great fun. A great range of bottled bears too. Staff very friendly. Really nice food worth a visit if a little pricey. Overall a good experience at OAKS! Food was really nice, the service was ok, but the price of the wine was extortionate! Nottingham’s OAKS is putting down roots in the city and branching out with a unique way of cooking locally sourced food over wood embers. The restaurant sits on the corner of Maid Marian Way and Bromley place in the heart of Nottingham’s bustling city centre and is easily accessible via foot, car or bus. This restaurant is a great rival for other eateries in the city carrying with it a plethora of positive reviews. The dining area at OAKS takes influence from Nottinghamshire’s rich heritage and British craftsmanship. 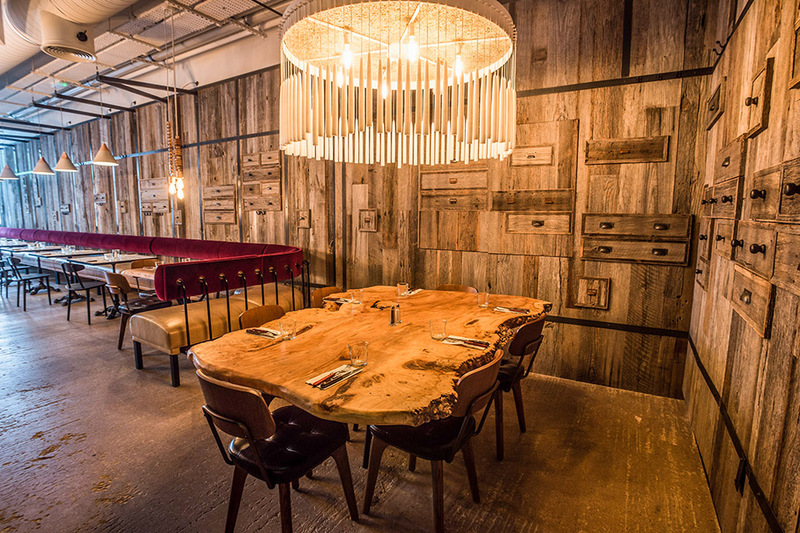 The décor uses only natural materials including charred wood and brick and hewn oak tables. 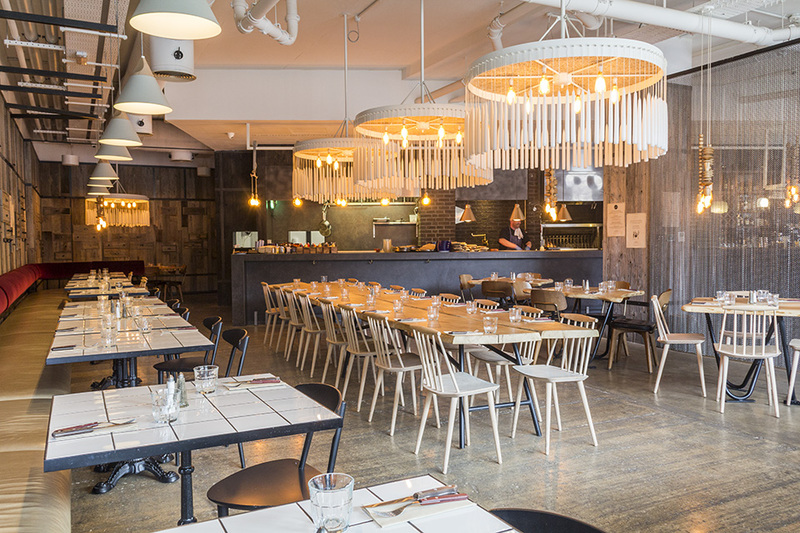 Diners will be able to take in the atmosphere of the open kitchen by watching the chefs prepare their food in an open-plan setting that is currently only being used in a handful of restaurants in the UK. The food is cooked over logs and chippings taken from the Nottinghamshire Wildlife Trust, which produces the wood through sustainable coppicing practices. OAKS' extensive menu offers huge, hearty burgers with an incredible variety of yummy fillings including Angus beef served in a Brioche Bun. 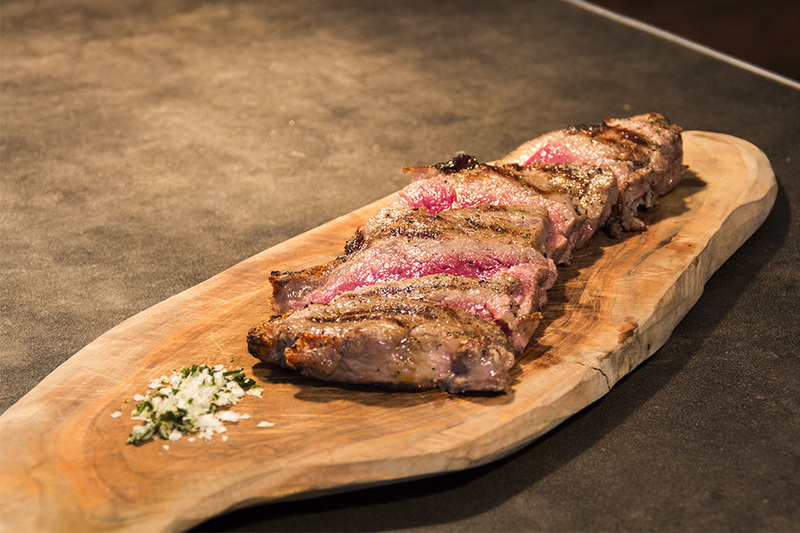 When dining at OAKS you should definitely try their Steaks and Meats dishes, which are only sourced from finest British farms. 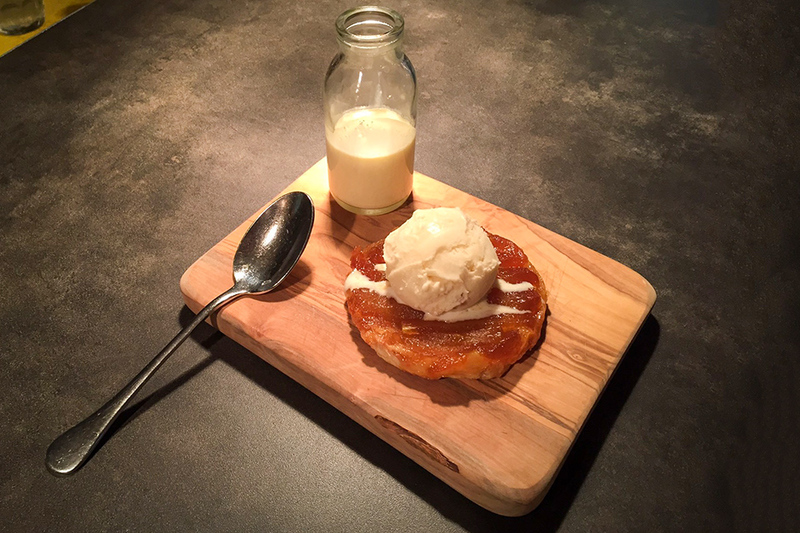 OAKS also offers a range of desserts including some twists on some classics such as Millionaires Shortbread with clotted cream and Bluebell Farm ice-cream selection including carrot cake, cherry bakewell and black cherry flavours. The restaurant’s drinks menu also includes a selection of craft ales from nearby brewery Castle Rock, wine by the carafe and a range of cocktails. Visiting OAKS in Nottingham is an experience not to be missed. All of the food is locally sourced and freshly made in front of you in the open kitchen with affordable prices for local, fresh ingredients. 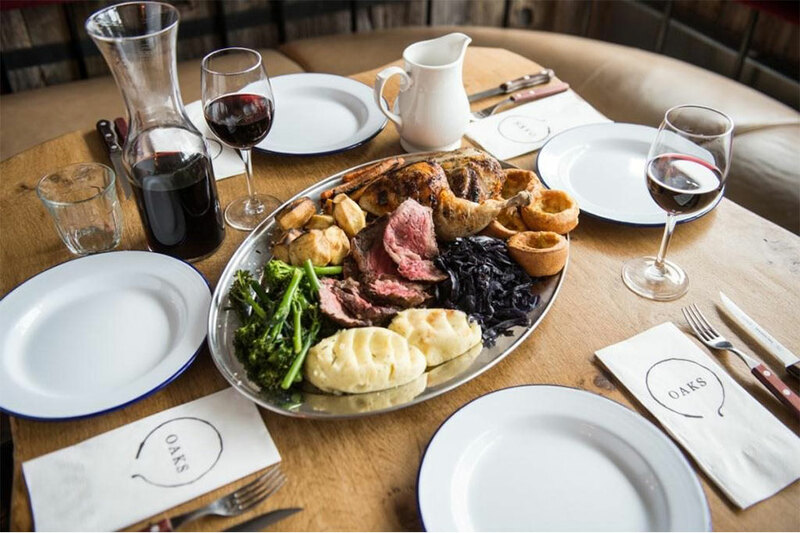 All of the staff are attentive and OAKS is perfect for groups wanting to celebrate a special occasion, or simply for those seeking a quality food in a vivacious atmosphere. All mains are served with your choice of hand-cut chips or chopped salad. If you suffer from any allergies or food intolerances and wish to find out more about the ingredients we use, please ask a member of the team. All our prices are inclusive of VAT. 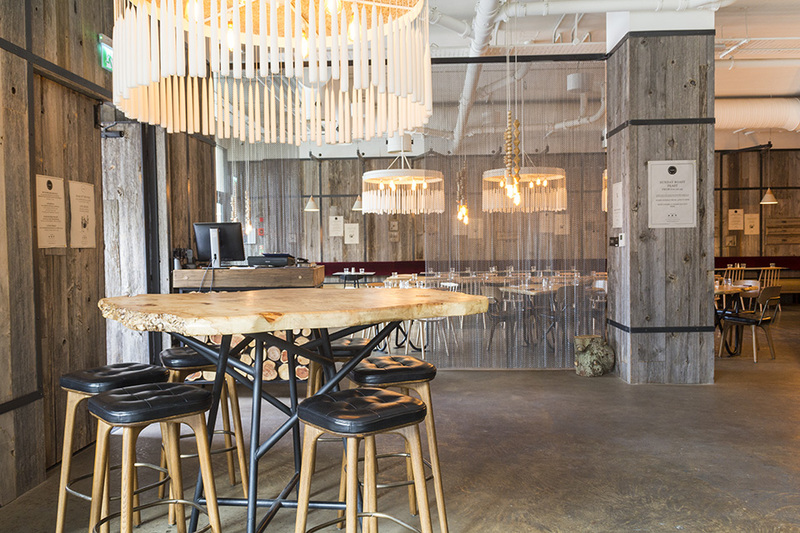 A discretionary 10% service charge will be added to tables of eight and more. Vegetarian dishes on the menu are marked (V). Made with prime British beef, served on a brioche bun. Enjoy your 2 course meal pre-theatre and come back for the dessert after the show. If you suffer from any allergies or food intolerances and wish to find out more about the ingredients we use, please ask a member of the team. Includes one main, two sides, ice cream and a drink. Tuck into a great value lunch at OAKS, Fridays from 12-5pm. Available from the set menu. 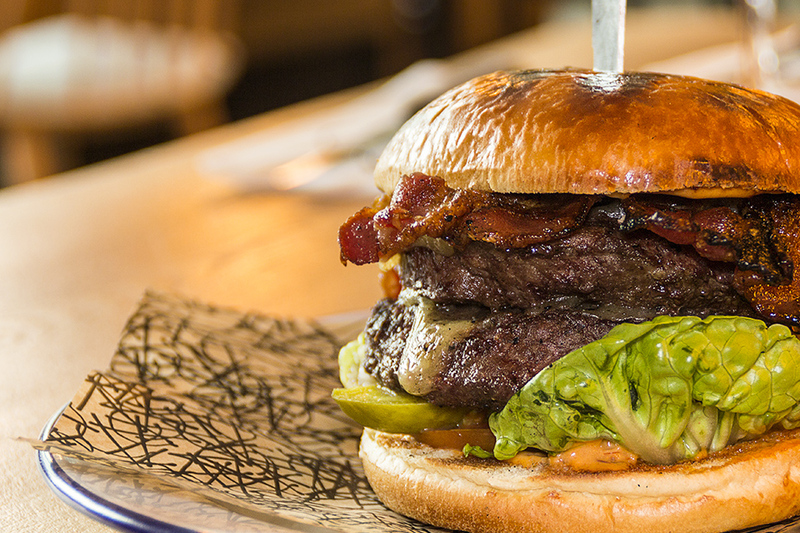 Enjoy a free pint of ale or lager with any burger purchased from the A La Carte menu at OAKS. Every Wednesday from 5pm. Get stuck in to an 8oz rump steak with hand-cut chips & peppercorn sauce for just £9.99, every Thursday from 5pm at OAKS. Kids can enjoy a main, two sides, ice cream and a drink for just £5 every day at OAKS. Available from the Kids Menu. Why not be a part of the wall of fame in Oaks Restaurant and Bar and take on one of the Oak's Challenges. For just 19.95 complete the Little John Burger Challenge.